From the Biofreeze website: "Biofreeze products are classified as topical analgesics, which work through a ‘counter irritant’ mechanism. This means that the menthol in Biofreeze creates a sensation that overrides pain signals to the brain. This process is known as ‘Gate Control Theory’, where nerve impulses from one stimulus block the nerves containing pain signals to the brain. Recent research also suggests that menthol may stimulate cold receptors in the skin that may help regulate pain as well." 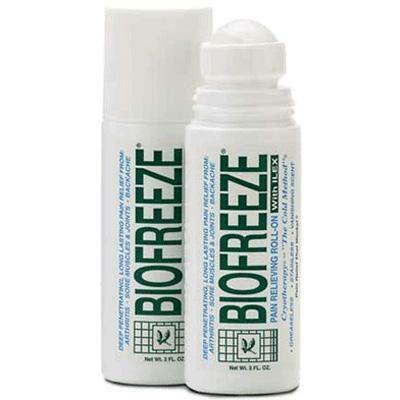 Biofreeze blocks pain receptors so that your nerves don't percieve pain. Decreasing pain is important to us, and this is one effective way to do it. Talk to your doctor about how to use biofreeze or other topical analgesics in conjunction with RICE thereapy, anti-inflammatory medication (such as ibuprofen) and other pain relievers.